How Does the Process of Mediation Work? The IRS has a new Fast-track Settlement Program for tax disputes with businesses. The process avoids a long and costly tax court process. In Texas, doctors and patients can use mediation to resolve billing disputes. Mediation is an informal dispute settlement process run by a trained third party, called a mediator. Mediation is intended to bring two parties together to clear up misunderstandings, find out concerns, and reach a resolution. The process is voluntary, although it may be urged by an agency like the Equal Employment Opportunity Commission (EEOC). During the mediation, each side presents its view of the issue, and the mediator will work with each side in a caucus to attempt to work out a settlement. At the end of the process, the mediator can present findings and present a potential solution to the issue. The mediator begins by welcoming the parties and introducing the parties to each other. The mediator then outlines the process and the roles of the mediator, the parties, and attorneys (if present). The mediator ends the introduction by explaining the ground rules for the process. The mediator then asks for statements from each party. Both parties have an opportunity to tell their story about what happened, from their viewpoint. Often, these stories are emotional. The mediator may ask clarifying questions, but typically the parties do not question each other. If the parties are too emotional, this part of the process may be cut short. After both parties have spoken, the mediator may ask more questions, both to clarify the issues and to provide the other party with greater understanding. At this point, the mediator may ask the parties to caucus (get together separately) for the purpose of discussion). The mediator talks with each party, proposing solutions, trying out scenarios, trying to get a commitment to a settlement by both parties. The mediator goes back and forth between the parties during this time, clearing up misunderstandings, and carrying information, proposals, and points of agreement. The mediator works to find points of agreement between the parties, in an effort to reach an agreement. At some point, the mediator may pose a final agreement for the parties and urge them to accept. Mediation doesn't eliminate the need for an attorney for each side. Although attorneys are not necessary, complicated and difficult mediations may include an attorney for each side. Mediation is often confused with a similar process called arbitration. Arbitration is a more formal dispute process in which an arbitrator hears both sides and makes a decision, which is often binding. The mediation process, unlike arbitration, is non-binding; that is, the mediator does not impose a decision on the parties, but he/she attempts to present a solution that is acceptable to both parties. 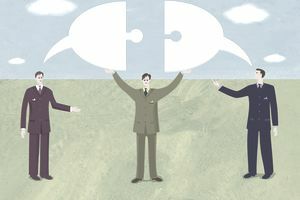 Some examples of how mediation is used in business situations come about with real estate issues. such as contract disputes; in labor negotiations, as a first step to sorting out differences between the two sides; or in employer-employee disputes. Mediation is also used in personal and family disputes. For example, in divorce, child custody, and special education situations. You can even find a mediator online, for several different types of mediation. Online mediation is a good resource if the two parties have an online relationship (like on eBay or other bidding sites) or if the parties are uncomfortable sitting across the table from each other. Blind bidding sites like Cybersettle offer mediation services for financial disputes. In this type of mediation, the two parties submit their prices online. The bidding site can arrange a settlement or suggest that the parties continue to submit offers. Discussion-based processing of disputes is offered by several sites. These services are better for more complex situations and in cases where the parties are not both in the same place and time zone. Mediate.com has a list of online mediators all over the globe, most of them with specialties. There are several services that list trained mediators for all types of situations, including Mediate.com. Look for a mediator who is trained in the specific area you might need for your business situation. You can also ask an attorney for a reference to a mediator in your area. What Is a Barter Exchange and How Does it Work? What Happens in Litigation or a Business Dispute? What Is Implied Authority in Business? How is Tax Nexus Determined?